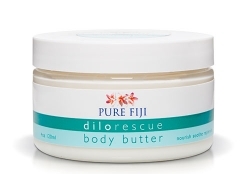 The Dilo Rescue Body Butter is a skin nourishing blend of cold pressed Dilo and Virgin coconut oils with the added benefits of Aloe Vera and passionflower extract to promote healing and revitalize your skin. This power packed soothing and nourishing cream will revive and restore the most dry and irritated areas of skin. Use topically on irritated and especially dry areas or all over the body for a natural nutrient boost.